As many of you probably know, I love teaching expressive and receptive vocabulary. Vocabulary is something our students significantly need. It’s not enough to create communication (i.e., you can’t teach vocabulary and hope the individual is going to be able to converse). However. 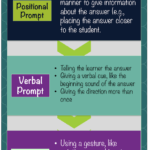 when the student starts to be able to communicate effectively, it’s critical that we move beyond just making requests. Making requests is the first step in communication, and the most reinforcing for most of our students. However, we need to think about moving beyond requesting. We also tend to do a good bit of labeling. Labeling and receptive identification of items by their name is important–as a first step. But again, it’s not enough to really expand the functions of language. It’s hard to have a conversation when you can only name things and request things. There is so much more to learn, like verbs to start (the topic of a different post). What Are Relevant Dimensions of Vocabulary? So one of the things we try to target after students can identify items by name is to have them find items based on their description, or their function, or their category. 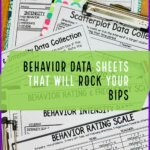 Many times this equates to teaching them to answer “wh” questions like “What animal barks?” or “When do you eat lunch?” In behavior analysis we often refer to this type of language as teaching receptive vocabulary by feature-function-class or RFFC. Feature of course would be any characteristic (color, size, pattern, shape, element-like a tail). Function of course is what it is used for or what it does (What do you drink out of? –a glass). 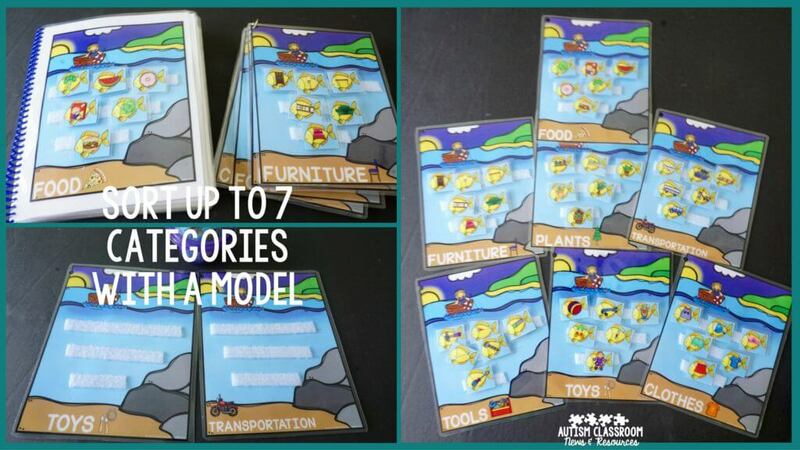 And class is the same as category–we initially teach kids to sort and then teach them to identify items from multiple categories. Along the same lines when we teach these skills, we also work on having them understand that there are multiple cues to attend to (a pivotal skill in PRT). For instance, things can have more than one characteristic (big and round; brown with laces) and they have to attend to all the relevant characteristics and differentiate between them. 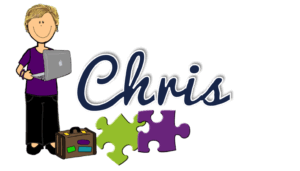 We also work on teaching them that multiple items can have the same name and characteristic or function or category. So there might be more than 1 item that we drink out of (e.g., a cup, a glass, a bottle, a soda can). Learning that one name or characteristic can be held by more than one item greatly increases their flexibility in using language and generating new combinations of language. How Do We Use This in the Real-World? This translates into real-world skills by being able to find things when someone describes it. For instance, if I sent a student to choose clothes to wear to an event, and I told him to wear his blue, long-sleeved shirt, I would want him to wear that one and not the blue short-sleeved shirt (it might be cold out), the red long-sleeved shirt (it clashes with his pants) or any other combination. We use this all the time to tell people how to find things (look in the left of the refrigerator for the bowl with the blue top for the leftover mac and cheese). We use this type of language when we tell people about something that happened to us (e.g., Then this really big, brown bear with sharp claws started walking toward us). It enriches our conversation and it enriches our reading and our writing. So, to help address this, most students with autism and other disabilities need explicit instruction in expanding this type of vocabulary. We often do that using discrete trials and we can also expand it by using naturalistic instruction strategies within everyday activities. However, we need ways for students to practice because there are such a wide variety of examples for them to learn and this skill is really only helpful if they can generalize it and use it. A student who just incorporates the characteristic into the label (e.g., always asks for a yellow, chewy candy) to make a request isn’t using the richness of language that we are trying to encourage. To help provide a variety of ways to practice, and to bump up the independent work for some students who have mastered these skills, I created my Receptive Vocabulary Seasonal Activities. Currently there are 4 of them, one for each season and you can find them individually or in a bundle that saves money. Each one contains similar activities with different themes. I’ve included some seasonal vocabulary but kept the categories and characteristics somewhat consistent for students to work on throughout the year. 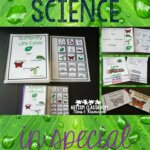 And what I love about them more is that they contain both materials you can laminate and reuse and materials that you can print out and use tomorrow with no prep needed. I completed the summer bundle recently and thought I would show you some of the activities. Then I will also give you some sample IEP goals that would fit with this type of task. I like these because you can have students sort between 2 categories up through 7 categories based on their skill level. You can easily switch up the categories they do each day. 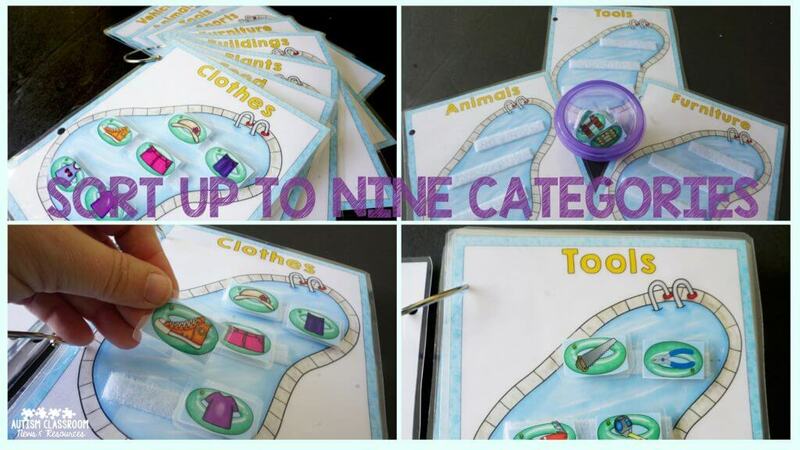 You could also use one category with different pictures and have them find just the category you are teaching. These are similar with a pool theme. There are 9 categories in this set with 6 items per category. You could have them sort by all 9 or from 2-8 depending on their skills. You can print and go with these color by category sheets. 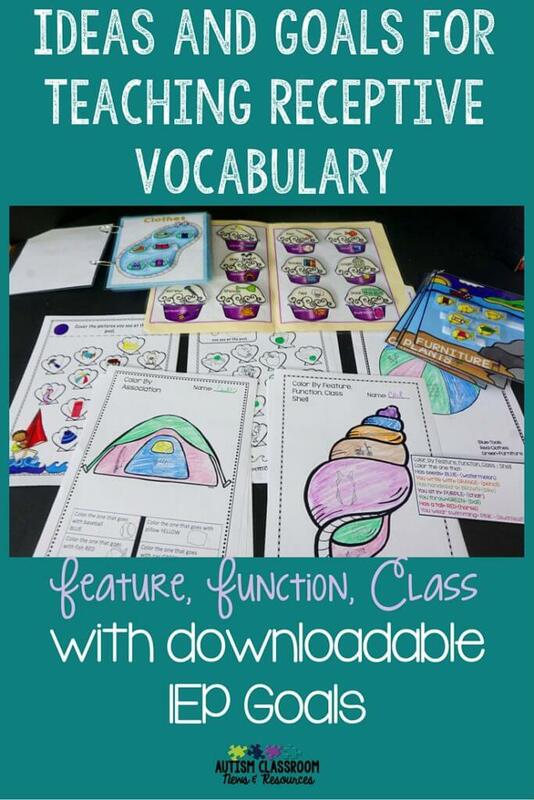 They are great for ESY and home practice of vocabulary over the summer. There are 3 to 4 categories on each sheet. I like to use these when working with small groups doing discrete trials so that one or two students are working on this (I tell them to find all the tools) while I do DTT with another student. This keeps them engaged in relevant activities and practicing their skills. You could also have the whole group doing trials with them by telling each to find all the tools and color them blue. Then find all the clothes and color them red, and so on. Each student would then be creating a permanent product and you could record data on prompting. 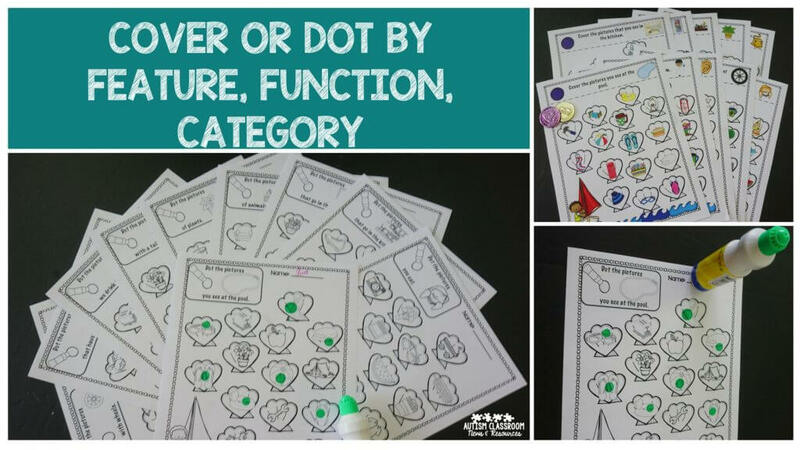 Cover or dot the picture by feature, function or class are great print and go materials to supplement discrete trial instruction and put in independent work. There are black and white and color versions. I like to use these in discrete trials the way I use the ones above. 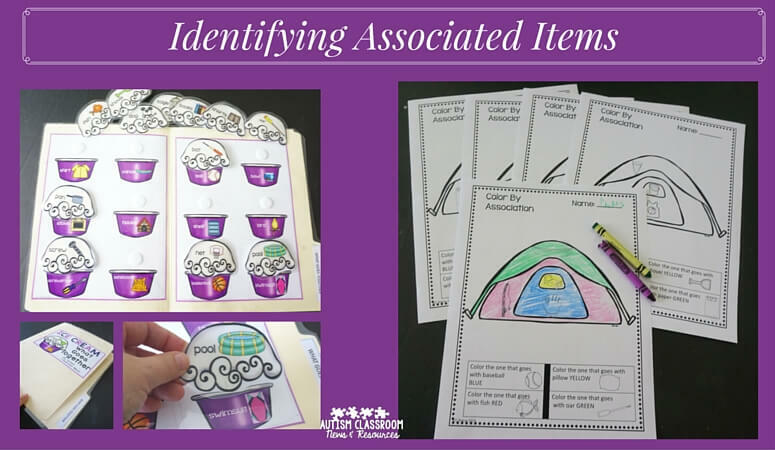 Two ways to identify associated items–color the one that goes with X and a matching file folder. 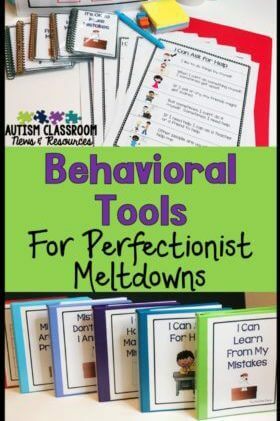 These work great in small group instruction as well as in independent work systems. 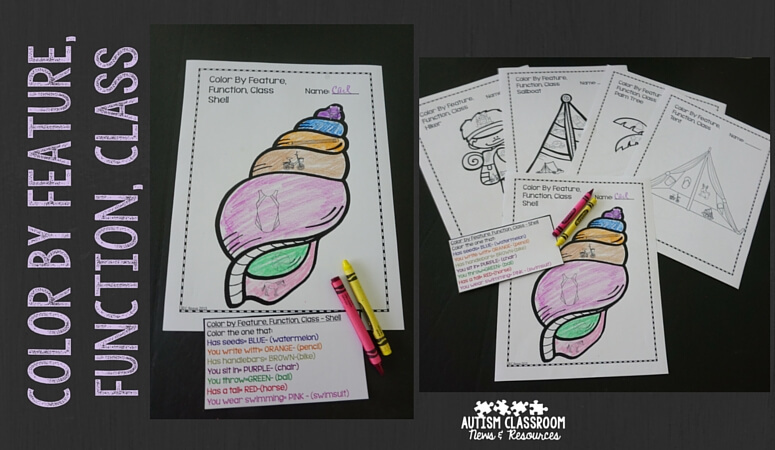 Color by feature, function or class is great for teachers to use in small groups. 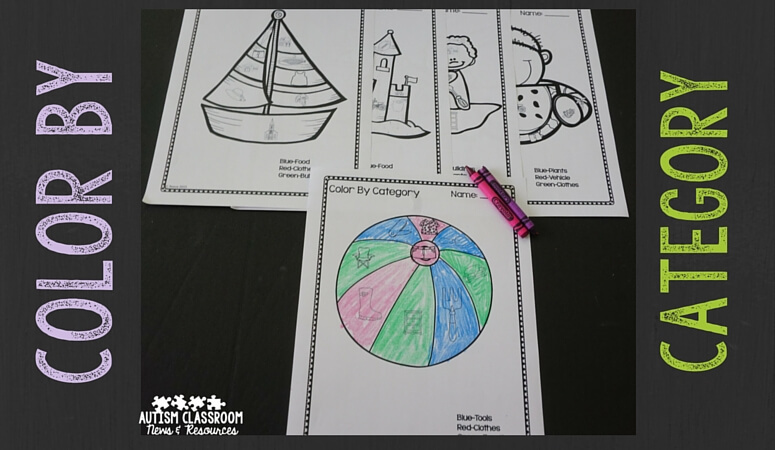 You can direct the student to color the one that barks blue. While one student is doing that, you can give another direction to another student. So, if you you are interested in these, click on any of the pictures above or check them out in my store. You can also purchase them in a money-saving bundle of all 4 seasons. You can read more about the winter activities in this post and spring in this post. And if you want to hear more about RFFCs and see the products, you can check out my Live Video preview from Facebook. And finally, if you are looking for some ideas about IEP goals for receptive vocabulary focusing on these types of skills, download the PDF of potential goals/objectives here.